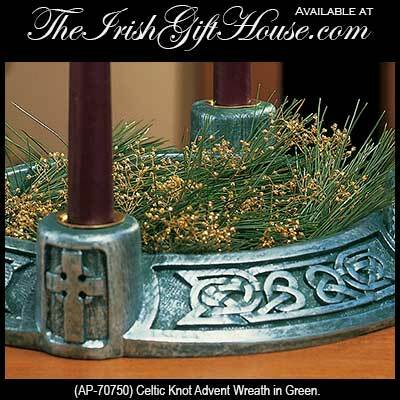 Your Christmas season will be complete with an Irish Advent wreath that features plenty of Celtic knots and the Celtic cross. 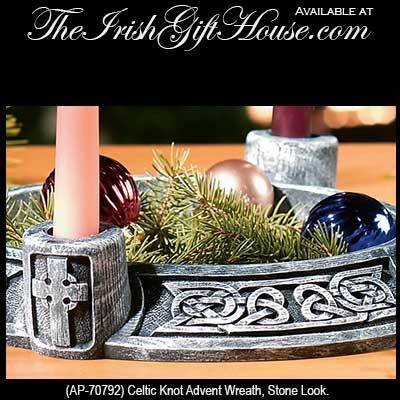 These Celtic Advent wreaths are complete with directions and candles. Advent starts on the fourth Sunday before Christmas and ends on Christmas Eve. With each ensuing Sunday during the Advent season an additional candle is lit in preparation of Christ's birth; each week has its own theme: hope, peace, joy and love. The Celtic Advent wreaths may be used as part of your Irish Christmas traditions; another tradition is the display of an Irish Nativity to welcome the birth of the Christ child. You may also start your own traditions with the selection of a Belleek Christmas ornament; there are several series that you may collect. Including our Irish angel tree toppers, The Irish Gift House has everything you need to usher in some holiday cheer, from Christmas ornaments to Irish Santa centerpieces. Our Irish Christmas decorations are also great gifts; we are always happy to include your gift note and gift wrap too. There is never any extra charge for this complimentary service.